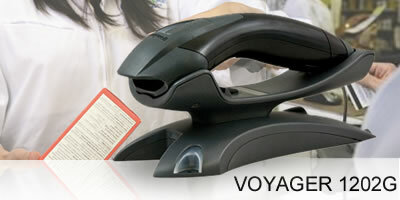 The Honeywell Voyager 1200 series of cordless single-line laser barcode scanners are some of the world’s bestselling due to their modern, ergonomic design and ability to read poor quality and damaged barcodes. And the Voyager 1202g adds the benefit of Bluetooth connectivity for wireless operations and flawless reading of all 1D barcodes up to approximately 33 feet range from the base. The Voyager 1202g also boasts a long lasting Lithium ion battery that provides 12 hours of use, and the battery is hassle free, toolless field replaceable. The Voyager 1202g offers other convenient features such as automatic interface type configuration, lost scanner paging functionality, and integration with Remote MasterMind™ device management solution that effortlessly manages and tracks usage of installed devices. The Honeywell Voyager 1202g Bluetooth wireless barcode scanner offers superior features, performance and a 3 year warranty at price less than $350, making it an ideal choice for retail and lite warehouse operations.